A disappointing second half performance saw the Bundesliga side leave London with a three goal deficit. Tottenham vs Dortmund highlighted some concerning areas for Die Schwarzgelben to address. For 45 minutes Dortmund had a foothold in this Champions League tie – however, their second half performance has become something of a familiarity for those who have watched them closely over the past month. From the moment Son Heung-min volleyed Tottenham into the lead, the Bundesliga leaders looked vulnerable – and not just at the back. Attacking wise, the normally potent machine looked flat and and slow. The absence of Marco Reus and Paco Alcácer undoubtedly didn’t help, but those brought in to the side at Wembley simply failed to make any sort of impact. Christian Pulisic was absent for most of the time he was on the field, the American cut a frustrated figure and spent large parts of the match on his backside lamenting the referee’s decisions – hardly the best of introductions to the watching Cheslea millions who tuned into this game just to see their new signing in action. The 20-year-old looked off the pace and unable to deal with the physicality of Tottenham – not the best sign for a player heading to the Premier League in July. Mahmoud Dahoud was another drafted in to face Tottenham, he also left the field with less than a whimper of note. It didn’t get much better at the back, Achraf Hakimi who has been a revelation at times this season had a night to forget. From front to back Dortmund looked slow and lethargic – something you just cannot be in this competition . 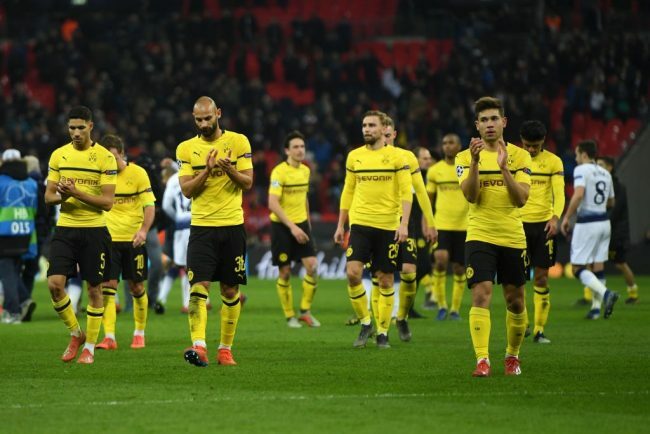 Lucien Favre has stressed throughout the current campaign that his Dortmund side are still one in transition, and that might be the case – however, this evening he was outdone by his opposite number. After seeing the kind of problems Dortmund could create during the first half, Mauricio Pochettino tweaked his Tottenham side during the break, Favre failed to respond – giving the hosts the upper hand. Questions will also be asked how Raphaël Guerreiro found himself not part of the starting XI. The Portuguese midfielder has been a key performer of late and his late introduction almost allowed him to claw one goal back. His energy saw the midfielder create a chance that hadn’t been seen prior to his cameo. Favre has his opportunity to outfox Pochettino in the second leg in two-weeks time, he should have an almost full plethora of players to chose from. The Swiss coach will hope that an impossible looking situation can be rectified. As Borussia Dortmund headed into the Winterpause in late December 2018, their position as ‘champions-elect’ looked a strong one – however, recent results have brought an air of unease to the situation. Picking up two points from their last two Bundesliga matches, the Borussen lead at the top of the table has been cut to five points. There will also be no spring in Berlin – dumped out of the DFB Pokal on penalties, Werder Bremen saw to that. Falling to a three-nil defeat in London ends a worrying run of results. The gap may be five points, but the Schwarzgelben still have to visit a resurgent Bayern. A defeat in the Allianz would see five points fall to two, and with it a real chance that the champions-elect could become just the ‘runners-up’. Next up for Lucien Favre’s side is a trip to bottom side Nürnberg – hammered seven-nil when the two sides met earlier this season. A similar result could just help kick-start a season that has hit an untimely bump in the road.